Yep, that’s the idea. We’re live blogging the mayor’s debate, for those of you who don’t want to come downtown to the Norm and see thing in person. Or maybe you will be at the event with your iPhone. Either way, join us at 7 p.m., assuming technology rewards our faith in it. Tonight our editorial board will interview Bremerton School Board candidates, beginning with the district 1 at 5 p.m. and district 5 candidates around 6 p.m.
Like we’ve done with other candidate interviews it’ll be shown live on the site, and archived over at the Kitsap Caucus afterward. Unlike the other interviews we won’t be able to accept comments and questions live. It’s a staffing thing. So if there’s something you’d like asked during our interview, post in the comments below. Thanks, and enjoy the show tonight. No, not “Vote, Dude,” but vote for the Dude. 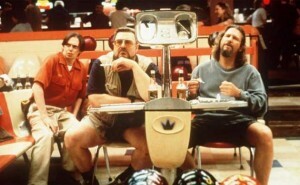 As in, Lebowski. Today Gardner announced that over the weekend he watched ‘The Big Lebowski,’ the Sun newsroom’s clear sentimental favorite for Bremerton’s Choice in the ongoing Movies on the Roof series downtown*. He wasn’t overly impressed, but the conventional wisdom here (and well, everywhere, as evidenced in Seattle RIGHT NOW) is that the movie grows on you. So Steve needs to watch it again, we’ve surmised. And preferably in the company of many others, and outdoors. So vote here, and give him the chance on Aug. 7 with all of us peer-pressuring and laughing at the right parts. Since that’s a pretty soft push for a guerilla campaign to get Lebowski elected, please quote the movie ad naseum in the comments and picque Steve’s curiousity. Lately he’s been very un-dude. *Last Friday was the first movie of the series on the old JC Penny’s roof, ‘Groundhog Day.’ I didn’t go, because I really, really don’t like Groundhog Day (other than that clever little ‘Needlenose Ned, Ned the Head’ bit near the beginning, which is kind of funny and quotable). The movie drove ‘I’ve Got You Babe’ into my head, which I’m sure was the annoying point, and I’ve always though they took a good premise and crushed it with a cliched ending. But I always was, and remained despite ‘Groundhog Day,’ a huge Bill Murray fan. So here’s the point: I was once at a Chicago Cubs baseball game at a packed Wrigley Field, with a standing room only ticket. In the 7th inning they have a celebrity sing ‘Take Me Out to the Ballgame,’ at least that was the tradition after Harry Carey died. I didn’t know who was singing that night because I was stuck squatting on a 100-level ramp on the third baseline, just to get a decent view of the game. It so happens that the particular ramp was how one got to the press box. So everyone erupts after ‘Take Me Out to the Ballgame’ ends, but I’m more concerned about stretching my legs and don’t pay attention. Until a guy starts weaving down the ramp toward me, rum and Coke in hand and wearing a Cubs hat cocked to the side. It’s Murray, and I realize he just finished the song. He looks tanked, but I managed to get my hand out when he’s a few steps away and say ‘Nice job Bill.’ It’s just the two of us in the aisle, he switches the cocktail to his left hand and shakes mine with the right, smiles and nods and he’s gone. My simple, timely, beautiful and brief meeting with Bill Murray. So I got that going for me. Bremerton’s five mayoral candidates met at the Cloverleaf this morning to explain their plans and views. It’s from these that I’ll go back and write the story, which you’ll see later. I don’t know if providing notes will be helpful or not, or whether I’ll do it again. I happened to have it work out this time and wasn’t interrupted during the debate, so for this one here you go. If there are any swear words in here, they’re accidental. No one said any. Man, I can relate. Here at the Bremerton Beat we love to toss jabs across the bathtub at our close, personal friends in Port Orchard and, if necessary, South Kitsap at large. Little gives us more joy than to find foibles and exploit them. Makes us feel bigger, you know? But in this case my Harborside Condominium-sized heart goes out to the Olalla man who saw the former love of his life driving around in the ride he paid for with another guy. Man, that’s gotta hurt. But hurtin’ is what happens in this life. Way back in 1983 and 1993 (2003 was just peachy.) I had massive stomps put on my heart. It was tough. It made me think of things I wouldn’t want anyone to know. One way I kept people from knowing some of my more awful thoughts was by not telling them. Another way was not doing them. Even in my most emotional moments, I managed to be rational. I might have wanted to yell at those women in public, or take out a particularly biting classified ad. But I didn’t. I knew that ultimately it wouldn’t help my cause. Olalla man didn’t trust that, though. He saw his ex-girlfriend driving the Chevy Blazer he paid for with some dude from California. So he flipped a Jake (That’s a U-turn in some parts.) and followed her, scared her and caused an accident. Fortunately no one appears to have seriously been physically hurt. As for the emotional scars I have no prognosis. For Olalla man I have a prescription for you next time you think you want to do something you’ll ultimately apologize to cops for. When that feeling in your heart runs up to your mouth and makes you want to shout random expletives at your former girlfriend, retreat. Find a music player and try to find a song that speaks your story. Feel, man, feel, like Port Orchard has to tell itself every time it compares itself with the jewel that is Bremerton. Find a half hour some time when you can listen to the song over and over, until you’re tired of it and tired of feeling bad about yourself. Dude, a song lets you know you’re not the only one forced to pick liver at the buffet table. For me the song was “I Wish I Were Blind,” by Bruce Springsteen in the 1993 drama. Risking copyright infringement, I’ll post the video here for you. I’m sure Bruce would understand. His lawyers probably won’t, but for you I’ll take that chance.